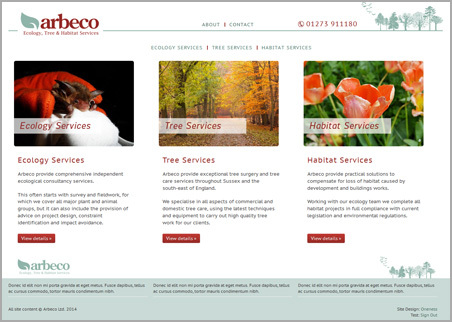 Arbeco provide comprehensive independent ecological consultancy, habitat and tree services. Arbeco's business has three clearly defined sections and they asked that this be clearly delineated. Although the majority of their visitors are potential business clients working from desktop computers, the web site is fully responsive and partially touch-optimised.